Can I use two transmitters with just one receiver? No. 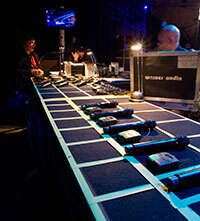 With wireless microphones, a dedicated transmitter and receiver are required for each wireless audio link. Furthermore, as the channel count (number of wireless audio links) increases, with analogue wireless systems (probably 99.9% of all of the wireless equipment currently in the market) careful calculations need to be performed in order to ensure that the wireless links do not interfere with each other. This type of interference, also known as intermodulation, can be caused by the additional 'spikes' that are generated either side of the main carrier frequency for a given link. If one of these spikes coincides with another frequency that is being used to deliver another audio link, then interference to the second carrier will occur. Fortunately, most, if not all manufacturers, group frequencies into 'banks' of compatible (non self-interfering) frequencies. Consequently, when deploying multi-channel systems, users are strongly advised to stick to the frequencies in given banks in order to avoid intermodulation problems. The situation is somewhat different with regards to in-ear monitor systems. In this case, one transmitter can serve as many receivers as can be fitted into the transmitter's coverage range. A second, third or fourth (the count can go on) transmitter or transmitters are only required if different performers require a different mix, or content. However, as the channel count increases, the same rules with regards to intermodulation apply. Common practice is to keep any in-ear monitor systems well away, in terms of frequencies used, from wireless microphones. This makes things much easier from a frequency planning point of view. It's all about antenna position - not receiver position. A common phone call sounds something like this: "I don't understand it. We ran all of the wireless systems up in sound check and they were fine. But once all the conference delegates (you could substitute audience, politicians, press people, here) came into the room some of the systems started dropping out". One of the biggest absorbers of RF energy is H20 - water. And we, as human beings, are 90% made up of the stuff. All too often, engineers will set their wireless systems up at the mix position, at the back of the room. Consequently, when the room fills with people, the relatively small RF output from the transmitter, in particular with body-pack systems given their close proximity to the human body of the presenter (also 90% water), can struggle to reach the receiver antennas - especially if those antennas are hidden away in the back of a rack. Far better to place the antennas and receivers at the stage end of the room and run the resulting audio back to the mix position via a balanced (or increasingly, digital) multicore. Problem solved. Another common industry mistake is to deploy multiple wireless microphone receivers each with their own set of antennas. If they are all in close proximity to each other, either stacked or in a rack, then the antennas will, inevitably, 'talk' to each other resulting in interference i.e. bad audio. It's far better to employ an antenna splitter and have a single pair of remote antennas servicing all of your receivers. Increasingly, remote directional antennas are used to maximise the pick-up of wanted RF signals and to minimise the pick-up of unwanted ones. With in-ear monitors we have a similar situation, but in reverse. Here, for ultimate performance, antenna combiners are used resulting in all mixes (frequencies) being transmitted by a single antenna. Again, directional antennas can help to concentrate the delivery of the desired signal to a given performance area, therefore helping to ensure that the performers receive uninterrupted audio. So, you have invested in an antenna distribution system and a nice pair of remote directional antennas. Very good, but these antennas now need to be connected to the RF input of your antenna splitter. It is imperative that good quality, low loss 50 Ohm cables are used. The cable lengths should be identical and the cable runs should be short as practically possible. For RF system installations where the cable runs have to be quite long then use of antenna cables with a solid core is recommended. RF boosters or amplifiers can be useful in situations such as this, but it is important to note that they should only ever be used to compensate for losses along the length of a cable. Using boosters on short cable runs is, generally, counter-productive as the RF input stage of the receiver can be overloaded. Any properly designed antenna system will deliver to the RF input of each receiver the 'normal' signal level that it is designed to accept. Too much RF input level can be as problematical as too little. In mobile deployment situations antenna cables should be checked regularly. It's all too common for a flight case to be rolled over an antenna cable resulting in a non-visible break in the copper conductor inside the cable sleeving. One obvious symptom of this is RF being received from one antenna, but not from the other. I'm still running my wireless systems in channel 69. Well, you shouldn't be. The finite resource that is UHF spectrum is divided up into TV bands - each 8 MHz wide. Channel 69 (854-862 MHz) used to be the nationally available 8 MHz TV band that was available for wireless microphone use, across the UK, subject to the user having a shared operator's licence. This is, emphatically, no longer the case. Channel 38 (606-614 MHz) has been designated in the UK (but not for the rest of Europe) as 'the replacement channel' for channel 69. Indeed, all of the TV bands from Channel 61 (starting at 790 MHz) right up to channel 69 (ending at 862 MHz) are, at time of writing, off limits for use by wireless microphones. This is because the licences to use most, but not all, of these frequencies have been sold to mobile network operators in order that they can roll out new 4G mobile networks. Assuming that take up of these new services is adopted by the public at large then more and more interference will be generated by the base stations and user equipment, rendering the operation of wireless microphone systems in these bands impossible. There is another reason why users should not be operating in these bands. You would be breaking the law. Arqiva PMSE (Program Making and Special Events - a generic term used to describe our industry's wireless activities) are legally prevented from issuing PMSE licences for any of the frequencies between 790 MHz and 862 MHz - therefore, if you use any of these frequencies, you are an outlaw. I don't need a licence to run wireless systems, right? Wrong, at least with one very small exception. Whilst the wireless equipment itself needs to conform to rules, regulations and common standards that are laid down by various bodies and institutions, all PMSE equipment users in the UK are subject to the Wireless Telegraphy Act. With the exception of a very small slice of UHF spectrum, specifically 863-865 MHz, all other frequencies between 470-790 MHz need some form of licence for the equipment to be legally operated. It currently breaks down thus; 470-606 MHz - Interleaved spectrum. A licence is required, in simple terms, on a where, when and for how long basis. 606-614 - Channel 38. A shared licence is required. Users have to coordinate frequency use between themselves at any given location. 614-790 MHz - Interleaved spectrum. A licence is required, in simple terms, on a where, when and for how long basis.